The colours of the music written by Françoise Choveaux plunges the listener into a world of images and emotions. Composer and pianist trained at the Juilliard School in New York, she takes her creative energy from meeting with artists, places where she has stayed as well as from literature and painting. In this sense her residence at La Prée for two years has placed her, like never before, in a situation of creation. She drew from there strength and vitality. Chamber music holds a special place for her and during the 2001-2002 season, three of her quartets were performed by the English quartet Duke Quartet and the Quatuor Stanislas in France. Her works have been performed in France, Belgium, England, Russia, Germany, United States, Brazil and Japan. For the 2002-2003 season, she wrote two important orchestral works at the request of prestigious ensembles: a concerto for bass trombone, performed by the National Orchestra of Lille and Yves Bauer, a concerto for orchestra for the Hungarian orchestra De Nubia from the Budapest Philharmonic. That same year, her Indigo Symphony was put on the repertoire of some orchestras (St Petersburg Orchestra, Symphonic Orchestra of Sao Paolo). As a composer, Françoise Choveaux has written more than 100 opuses: her work is performed by soloists or in leading chamber music training. As a pianist, she has emerged as a privileged interpreter of French music: the international and specialised press have elected her recording (10 from repertoire, 5 Diaspons) of the integral work for piano of Darius Milhaud a world premiere. Now she has decided to insert in her programmes (solo, orchestra, chamber music) work that she has written. She is also artistic director of the European association ‘Musiques en Eurorégion’. OPUS DISSONUS - What was your first contact with the art of composing? What motivated you to start? 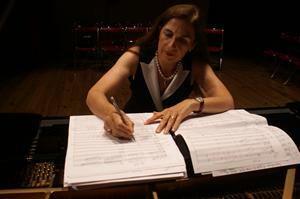 FRANÇOISE CHOVEAUX - When I started studying in the Conservatoire of Lille, the composing classes were mandatory for those studying organ (I first started to play the organ as I was too old to enter the Conservatoire with piano classes, I took private lessons with a concert pianist in parallel and six months later I was admitted to the intermediary level). OPUS DISSONUS - How does your compositional process works? 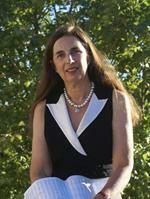 FRANÇOISE CHOVEAUX - I am inspired mostly by nature, my trips around the world, and poetry. Paint also inspires me a lot. For me, a musical work is like a painting in motion. I start to compose in my head a work when I am driving or quiet. And after, I write it in one breath. OPUS DISSONUS - Which ones of your works may, in your own view, be regarded as "introductory" or "obligatory" for those who want to know more about your compositions? FRANÇOISE CHOVEAUX - The concerto for Violin n°2 for orchestra and violin, the winter sonata for piano solo, the white symphony for organ and strings (created in Notre-Dame de Paris), the two quintets for piano and string quartet, and the four string quartets. These are the works I prefer, for the moment ! OPUS DISSONUS - How would you describe your own style of composing? FRANÇOISE CHOVEAUX - Very orchestral, colorful and powerful; shape is very important for me, and so is having melodies. OPUS DISSONUS - Who are the composers who have had the greatest influence on your work, from the earliest compositions to the present? FRANÇOISE CHOVEAUX - When I was young, my dad would paint while listening to Ravel, Debussy, Bartok, Prokofiev... And this has certainly inspired me. Nevertheless, French and Russian music are the most important musics that have influenced me and my compositions. OPUS DISSONUS - You mention in your CV you have had music classes at Juilliard School. Is there any special teacher who also influenced your work? FRANÇOISE CHOVEAUX - I was in Eric Ewazen’s class and when I was during two years in Julliard, I went to the music library to listen to all the American composers. When I was in Julliard I already had in mind the main ideas and colours of the music I wanted to write, that is why I wasn’t influenced that much by the individual ways of teaching of the teachers I had there. OPUS DISSONUS - You are known also as one of the greatest interpreters of French music, and you recorded the integral work for piano by Darius Milhaud. How much has french music influenced your own compositions? FRANÇOISE CHOVEAUX - Maybe the refinement and subltety of the colours. OPUS DISSONUS - A critic from Le Nouvel Observateur wrote that your music is a kind of present-day Debussy's music, because of its great quality. How much your and Debussy's musical thoughts are similar (or diferent) in your own opinion? FRANÇOISE CHOVEAUX - My music is similar to that of Debussy in the way of describing nature, in polytonality and in the refinement of the atmospheres, with a very special touch and a thorough musical analysis. OPUS DISSONUS - You have composed very interesting Etudes in homage to Chopin and Liszt. tell us about the inspiration you had to write them. FRANÇOISE CHOVEAUX - About the Etudes in homage to Chopin, they are short like Chopin’s Etudes and each one of them has their own technical difficulty. 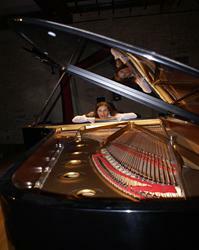 As to Liszt, they are also short and very technical. The inspiration comes from deep within and is difficult to explain with words: when I started to write these studies, I just sat and wrote with a lot of energy and hapiness. OPUS DISSONUS - I read in the CD booklet of your String quartets recordings that each of your works are inspired by journeys, inner emotions, paintures, literature, etc. And your 3rd Quartet (Op.101) is named "Quatour Brésilien". How did you get the first contact with the brazilian music? and How much this music influenced your work? OPUS DISSONUS - What are your composicional projects for the future? FRANÇOISE CHOVEAUX - The purple symphony for strings for the Youth Orchestra of St-Petersburg. The “Milles et une pâtes” for narrator, with the same orchestration than that of the Carnival of animals of Saint-Saens. I will also write a pocket opera for Staat Berliner Opera. A piano prelude also in homage to Debussy. OPUS DISSONUS - In your opinion, what can we expect for the future of classical music? FRANÇOISE CHOVEAUX - I expect more shape in writing, more musicality, playable music for instruments, and works that the public can love and enjoy listening to. OPUS DISSONUS - What are your impressions of the youngest generation of composers? Do you know them? FRANÇOISE CHOVEAUX - I think that it is easier to write nonsense, sounds that go in any direction; sometimes, no idea is developed and it is hard to understand the work as a whole. It is a trend, like in painting: now some works are just nonsense: one can wonder if these works rely on a proper inventiveness. Picasso would be the example of the contrary of this new trend in music, or painting. I think that we can recognize an interesting composer to his unique writing. Nevertheless, there are some very good young composers today. OPUS DISSONUS - What words would you say to an aspiring composer? FRANÇOISE CHOVEAUX - I would advise him, or her, not to write according to a trend, but according to what relies deep inside of him/her.